While crude prices remain deflated this spring, some energy sector names look primed for breakouts. BALTIMORE (Stockpickr) -- If there's one sector you didn't want to own in the last six months, it's energy sector. As oil prices have plummeted since last summer, the energy sector has seen its profits shrink -- and its share prices tumble in kind. But as nasty as it's been to own these stocks lately, counting oil and gas stocks out in 2015 might be a bigger mistake. That's because while crude prices remain deflated this spring, some energy sector names look primed for breakouts. That's a rebound you won't want to miss, especially considering how hard to come by performance has been in the broad market this year. That's why we're turning to the charts to find five big energy stocks to buy for breakout gains this month. For the unfamiliar, technical analysis is a way for investors to quantify qualitative factors, such as investor psychology, based on a stock's price action and trends. Once the domain of cloistered trading teams on Wall Street, technicals can help top traders make consistently profitable trades and can aid fundamental investors in better planning their stock execution. 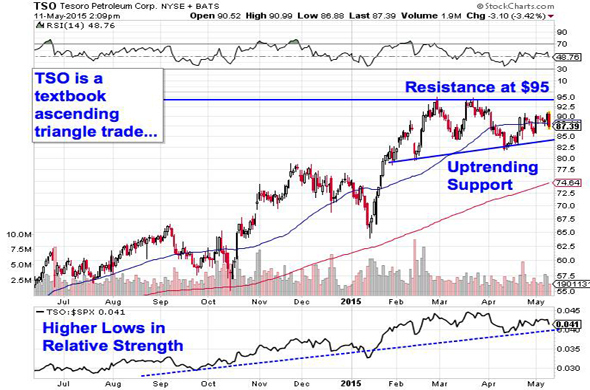 Without further ado, let's take a look at five technical setups worth trading now. Up first is refiner Tesoro (TSO. It's easy to think that anything exposed to the energy sector has been selling off this year, but that's just not the case. In fact, shares of Tesoro have been stomping the rest of the S&P 500 in 2015, up more than 18.7% since the calendar flipped to January. Don't worry if you missed the move, though. TSO looks primed for another leg higher in the near-term. Tesoro is currently forming an ascending triangle pattern, a bullish price setup that's formed by horizontal resistance above shares at $95 and uptrending support to the downside. Basically, as shares of TSO bounce in between those two price levels, this stock has been getting squeezed closer and closer to a breakout above our $95 resistance level. When that breakout happens, we've got our buy signal. Relative Strength, down at the bottom of the chart, adds some extra evidence to the upside in TSO. That's because relative strength has been in an uptrend of its own over the course of the price uptrend, which indicates that Tesoro isn't just moving higher -- it's outperforming the rest of the market long-term. As long as that relative strength uptrend remains intact, expect Tesoro to keep beating the S&P. We're seeing the same setup in shares of mid-cap offshore driller Atwood Oceanics (ATW. Like Tesoro, Atwood is forming an ascending triangle pattern. The big difference here is that Atwood's setup is coming in at the bottom of a prolonged downtrend. The buy signal comes on a push through resistance up at $35. Shares are flirting with a breakout through that level this week. Why all of that significance at that $35 level? It all comes down to buyers and sellers. Price patterns, like this ascending triangle pattern in ATW, are a good quick way to identify what's going on in the price action, but they're not the actual reason a stock is tradable. Instead, the "why" comes down to basic supply and demand for Atwood Oceanics' stock. The $35 resistance level is a price where there has been an excess of supply of shares; in other words, it's a spot where sellers have previously been more eager to step in and take gains than buyers have been to buy. That's what makes a breakout above $35 so significant -- the move means that buyers are finally strong enough to absorb all of the excess supply above that price level. It's important to be reactionary on this trade. Don't buy ATW until buyers shove this stock above resistance. Another offshore drilling contractor that's been under pressure lately is $6.5 billion rig operator Seadrill Limited (SDRL. The price action in Seadrill has been a bloodbath lately. In the last 12 months, this stock has lost more than 60% of its market value. But long-suffering shareholders could be in store for a reprieve with their SDRL stakes in May. Put simply, Seadrill looks "bottomy" here. Here's how to trade it. 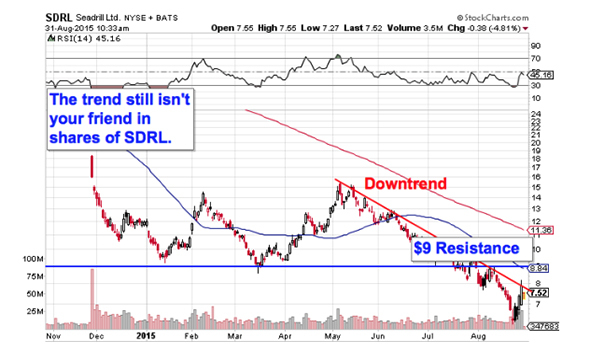 SDRL is currently forming a double bottom pattern, a bullish reversal pattern that looks just like it sounds. The double bottom is formed by a pair of swing lows that find support at approximately the same price level. The buy signal comes on a breakout through the peak that separates though two troughs. 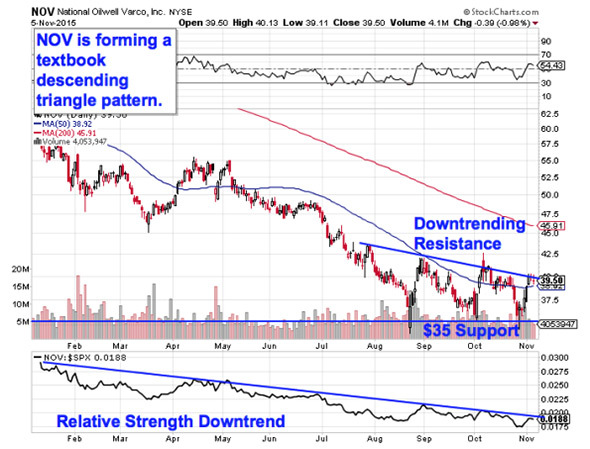 For SDRL, that's the $15 breakout level. Momentum, measured by 14-day RSI, adds some extra upside confidence to the setup in Seadrill. Our momentum gauge has been in an uptrend since January, making higher lows during SDRL's pair of price lows. That's a bullish divergence that indicates that buying pressure has been building under the surface. When $15 gets taken out, SDRL becomes a buy. The smallest stock on our list today is $1.5 billion Exterran Partners (EXP, a natural gas compression services firm. The good news is that you don't need to be an expert technical trader to figure out what's been going on in shares of Exterran. 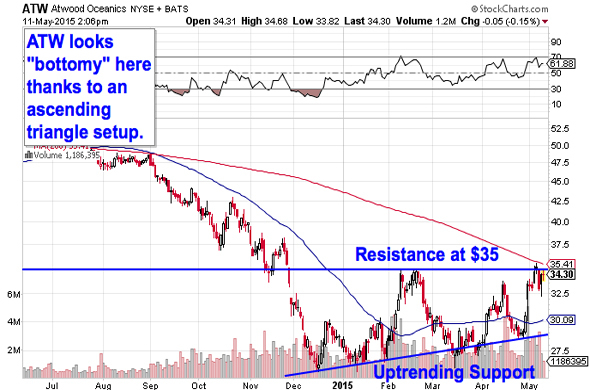 The price action in this small-cap energy stock is about as simple as it gets. 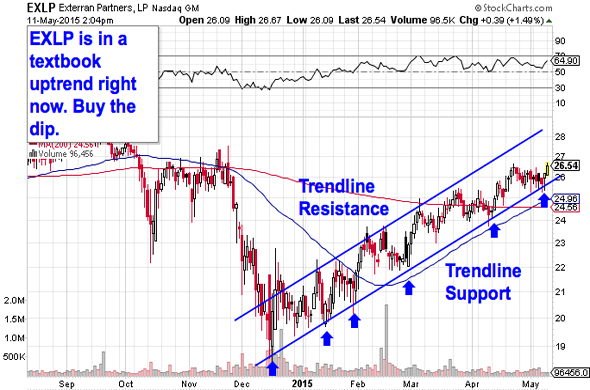 EXLP has been bouncing its way higher in a well-defined uptrending channel since mid-December, moving higher on every test of trend line support. That channel identified the high-probability range for shares of Exterran to stay within. So as EXLP comes off of support for a sixth time now, it makes sense to buy the bounce. Waiting for that bounce is important for two key reasons: It's the spot where shares have the most room to move up before they hit resistance, and it's the spot where the risk is the least (because shares have the least room to move lower before the channel breaks, and you know you're wrong). Remember, all trend lines do eventually break, but by actually waiting for Monday's bounce to happen first, you're ensuring EXLP can actually still catch a bid along that line before you put your money on shares. If you decide to buy here, the 50-day moving average is a logical place to park a protective stop. It's been acting like a good proxy for support since February. Last but certainly not least on our list of potential energy sector breakouts is National Oilwell Varco (NOV - Get Report). Like other oilfield service providers, NOV has sold off in the last year, but it's starting to show some classic signs of a bottom. Now, the price level to watch is $56. NOV is currently forming an inverse head and shoulders pattern. You can spot the inverse head and shoulders by looking for two swing lows that bottom out around the same level (the shoulders), separated by a bigger trough called the head; the buy signal comes on the breakout above the pattern's "neckline" level. Momentum is an important add-on indicator on this chart too -- 14-day RSI made higher lows on each of the troughs in NOV's inverse head and shoulders setup. Lest you think that the inverse head and shoulders is too well-known to be worth trading, the research suggests otherwise: a recent academic study conducted by the Federal Reserve Board of New York found that the results of 10,000 computer-simulated head-and-shoulders trades resulted in "profits [that] would have been both statistically and economically significant." That's a very good reason to keep a close eye on NOV's $56 level here.